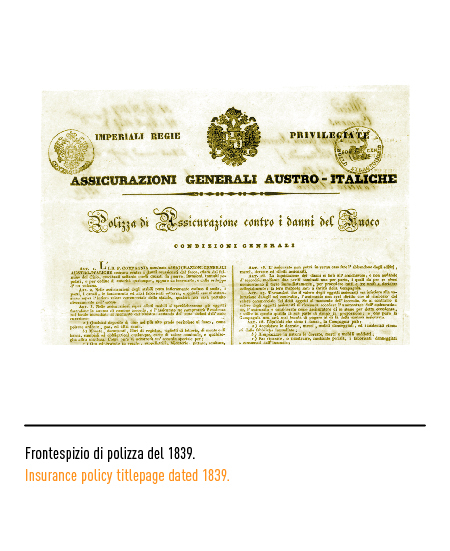 It was 1831 when a group of Triestine, Venetian, and Austrian businessmen pooled their resources to set up this insurance company in Trieste itself. The location was a natural choice as at the time the city was one of the Austro-Hungarian Empire's chief maritime trading outlets. So much so that in 1775 it had been granted a free port charter by the Empress Maria Teresa. 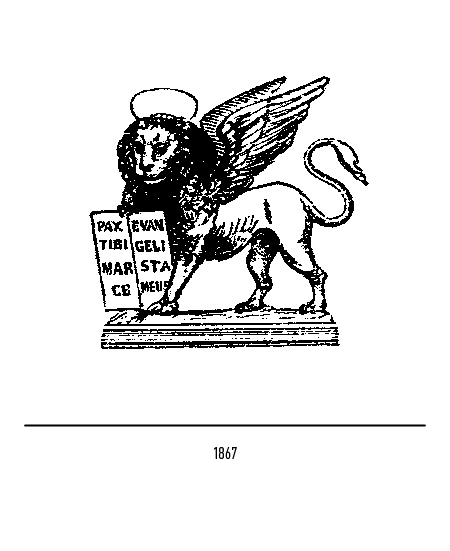 The lion of Saint Mark as the firm's emblem was no casual choice as it demonstrates a keen sense of the historical and political balance of power then prevailing in Italy and Europe. 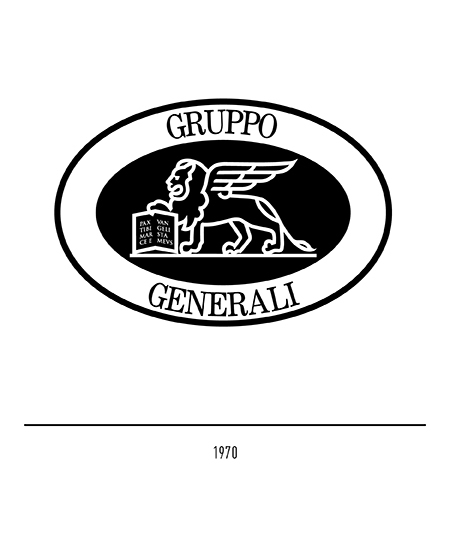 The company was initially called "Assicurazioni Generali Austro-Italiche" and to begin with it was given a dual organisational set up. 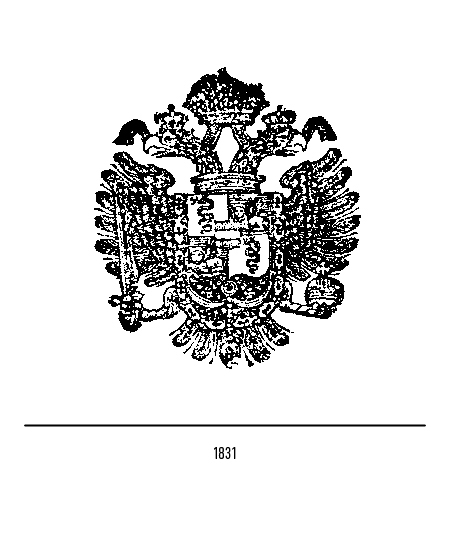 General management in charge of operations in the Hapsburg Empire was based in Trieste, while management in charge of co-ordinating business in the various states in which the Italian peninsula was divided was based in Venice, the capital of the then Lombardy-Veneto Kingdom. 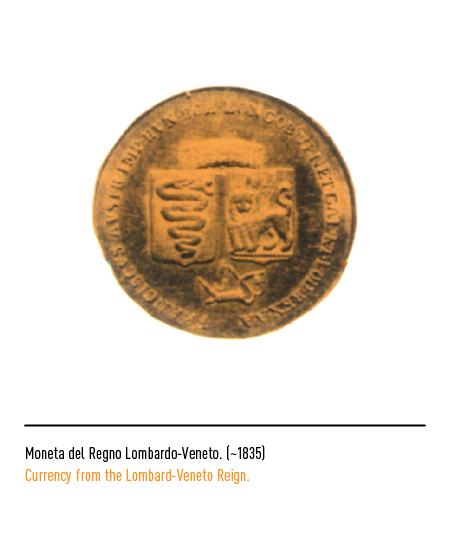 In 1831 the first trade-mark sported an Austro-Hungarian imperial eagle with the symbols of the Lombardy-Veneto Kingdom, namely the serpent of the ancient Visconti coat-of-arms and the Venetian winged lion, in the middle for good measure. 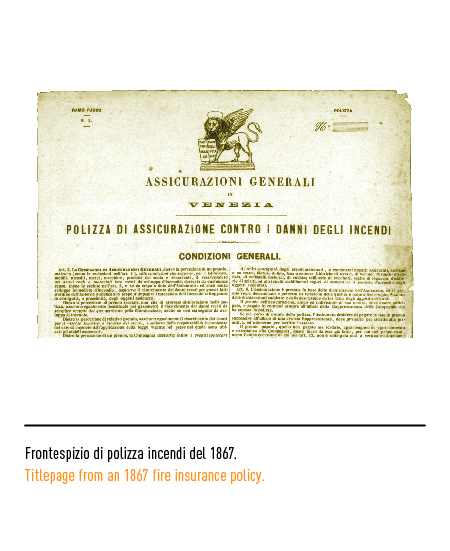 The revolts of 1848 led, among other things, to the establishment in Venice of the short-lived Republic of Saint Mark. The firm's patriotic and liberal bent induced it to highlight its national identity. 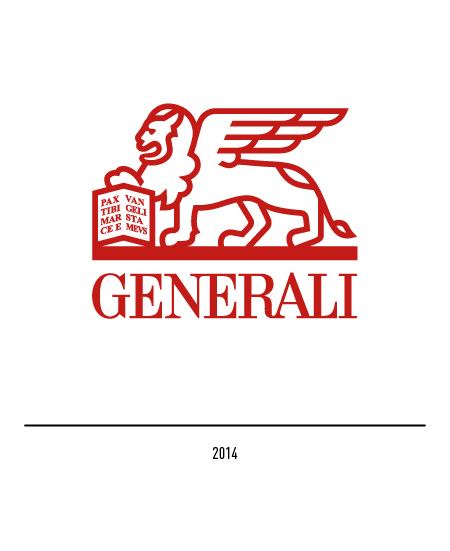 General management moved to Venice and the wording "Austro-Hungarian" was deleted for obvious political reasons so that the company's name was changed to "Assicurazioni Generali". 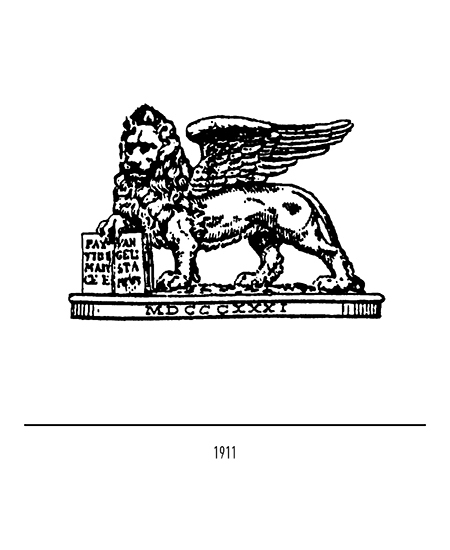 The double-headed Austro-Hungarian eagle was replaced by the lion of St. Mark. 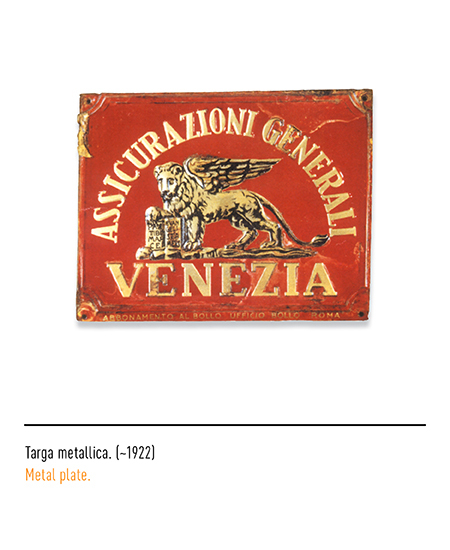 As the emblem of Venice, a merchant city par excellence, it was also a old-established symbol of enterprise and economic good-standing. 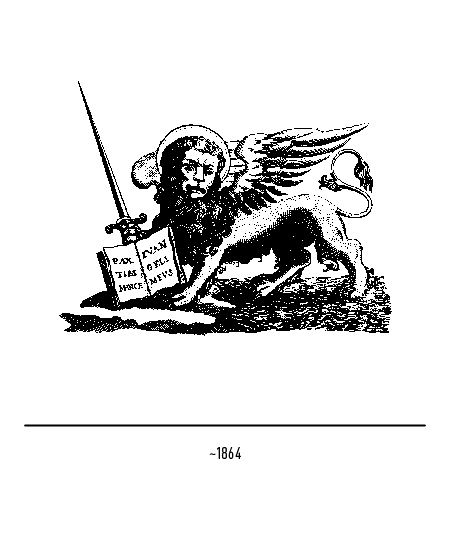 This lion, inspired by the one adopted for the flag of the Republic of St. Mark in 1848, was set facing left but in majesty (that is, with its face turned frontally), and portrayed with a halo, a double-voluted or "S" shaped tail, and a unsheathed sword in defence of an open book of the Gospel with the words "pax tibi Marce evangelista mevs" printed on it. 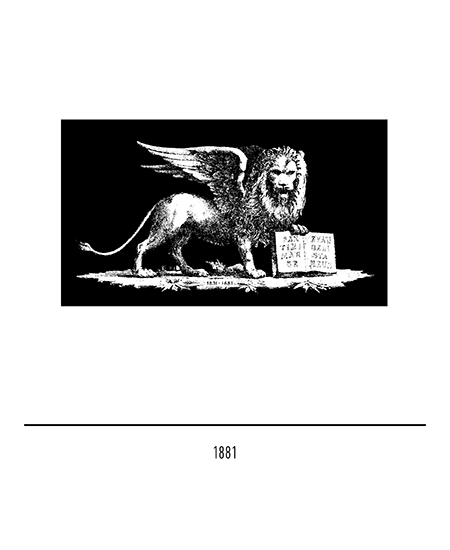 Even though prevailing in the afore described version, other sword-bearing or sword-less lions appeared on and off until in 1881 with the company celebrating its golden jubilee it was also decided that only one, uniform version should be henceforth used. 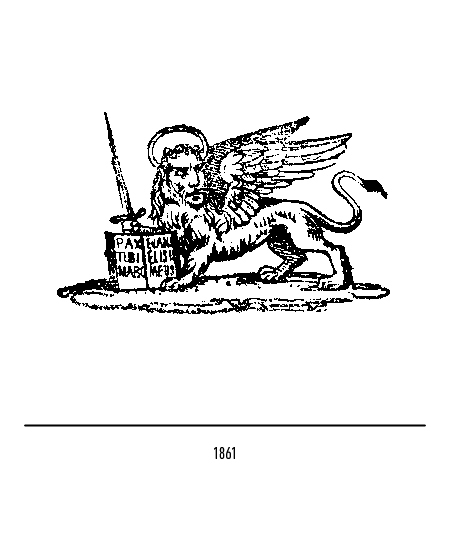 This time the lion, still in majesty, was facing right and had lost its halo and a tail spiral. A left-facing version was, however, still extant. Another unstable feature was the addition or subtraction of the fiftieth anniversary date between the lion's front or rear paws. The left-facing lion was re-adopted in 1903 but this time on plinth. 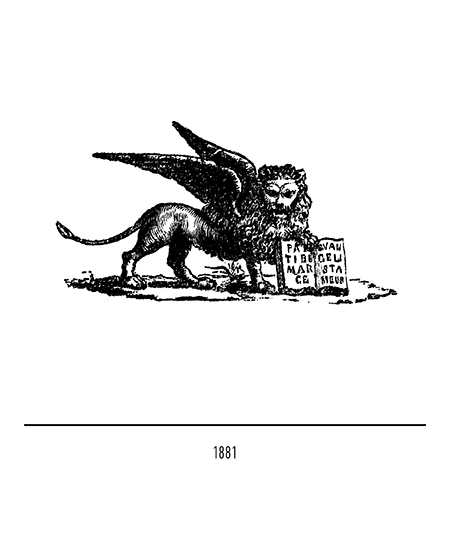 A wing was also discernable behind the head that had been turned as if to display its profile, to the detriment, it should be added, of the majesty of the lion's almost human countenance. 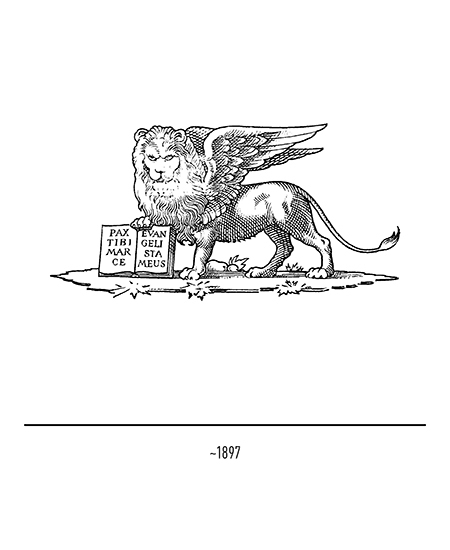 The defect was however remedied in 1911 when a new lion with the year of the company's foundation clearly displayed appeared on the scene. 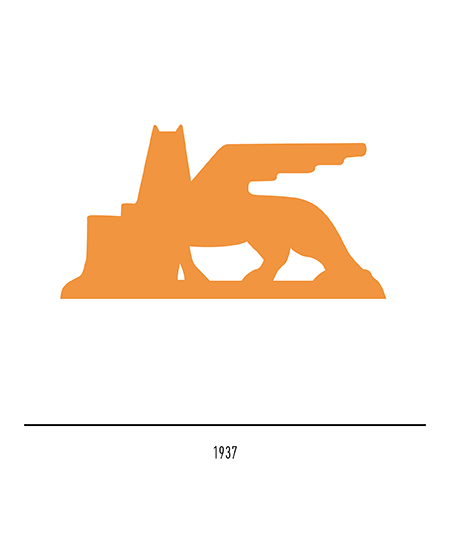 This device was to survive essentially untouched for almost sixty years, except for a slight restyling during the Fascist period. 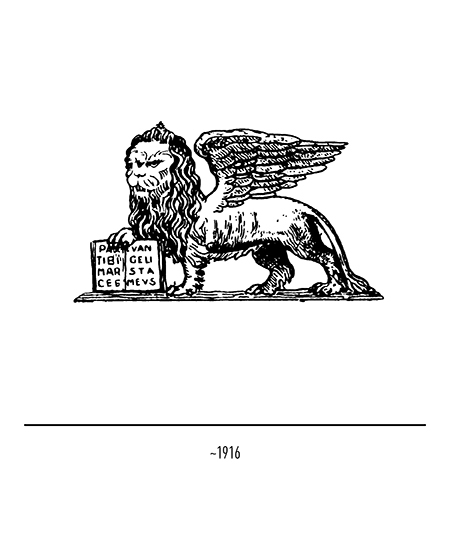 The 1911 trade-mark minus the date of the company's establishment may still be seen on the name-plates of buildings belonging to the company. 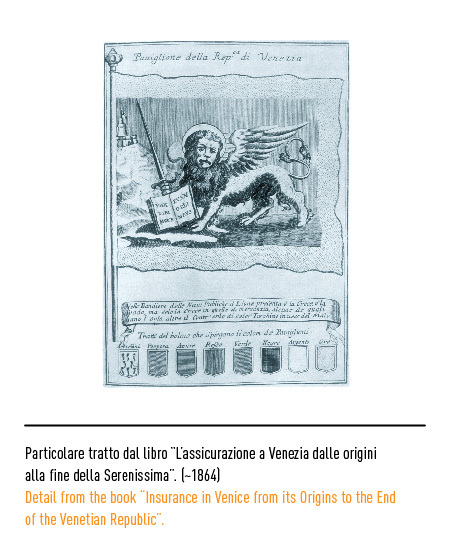 This proliferation of leonine models may be explained by the fact that the famous artists called in to design the device made changes according to prevailing styles and their personal flair. 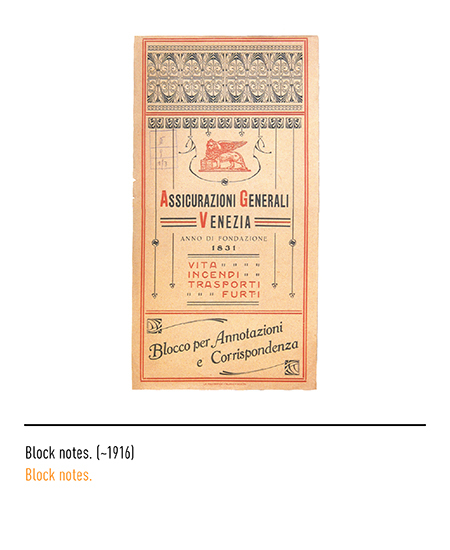 By the end of the Second World War the company-image function proper of the trade-mark had been superseded by one of brand identification so that it was chiefly used in a competitive frame. 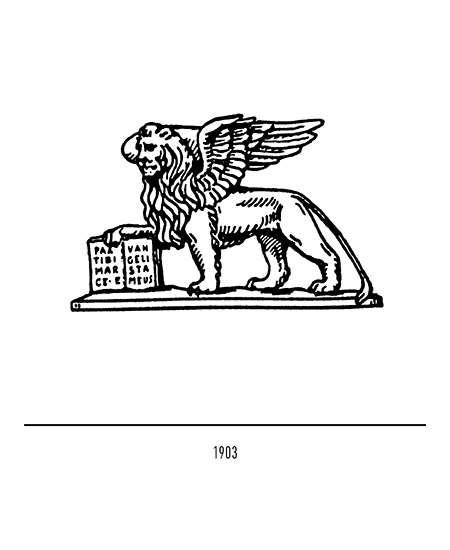 The old Marcan lion clearly called for restyling as well as guidelines for its use, also because other Venetian firms had adopted similar-looking devices. 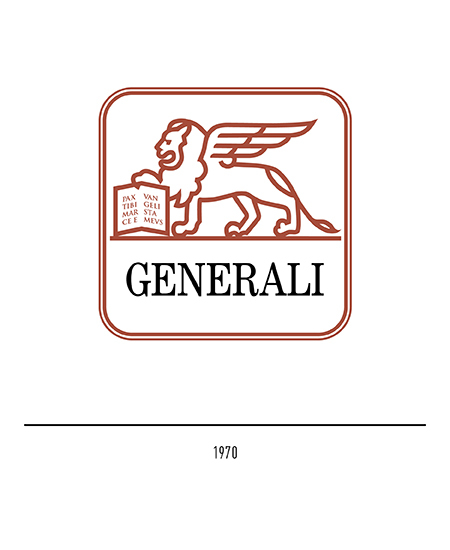 In 1970 a stylised trade-mark appeared with the lion enclosed by a frame and the shortened name of the company, "Generali", in upper case Century lettering also printed on the inside. 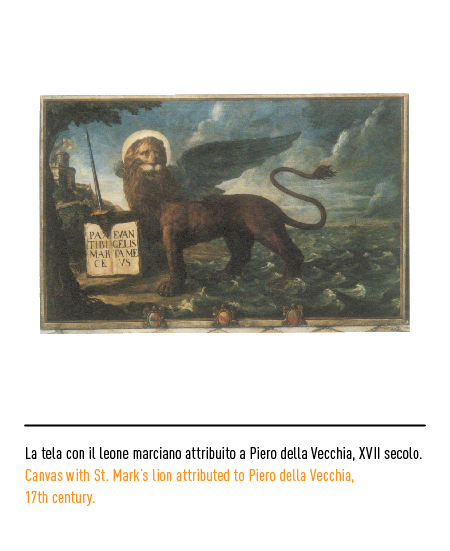 In this restyling geometric rendition highlighted the lion, shown for the first time set side-ways. 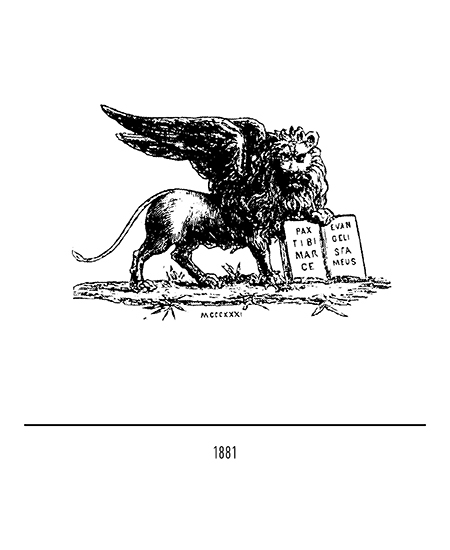 The Group also had its trade-mark designed in the same year, and this was touched up again by Publicis Étoile of Paris in 1991. 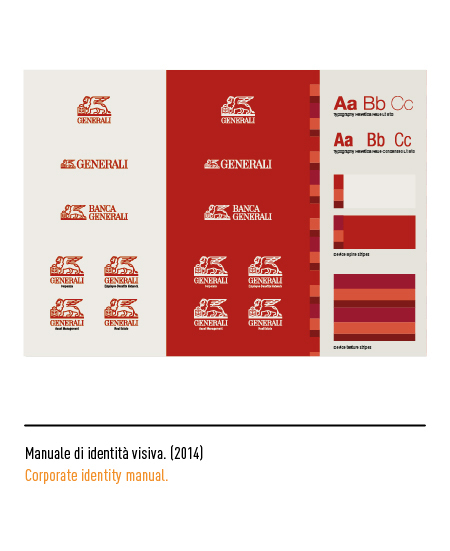 Nel 2014 the restyling of the logo is appointed to Landor; the new modernized lion will be the exclusive symbol for the group on a worldwide scale. The use of the "cut" lion, representing the different realities of the different countries, will be abolished. 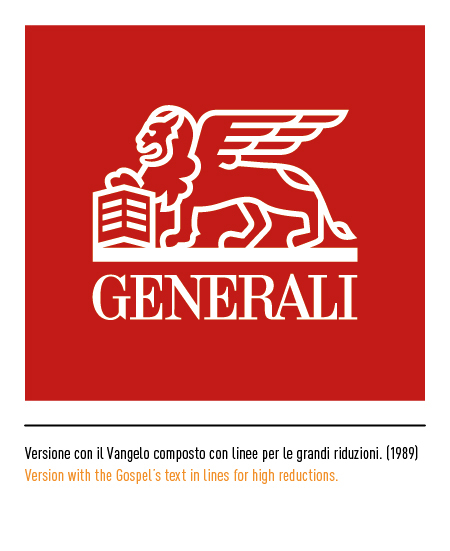 The graphic intervention focused mainly on few iconographical elements: the muzzle to improve the profile of the head, the wings and the text on the Gospel turned into lines so to improve the yield in small resolutions; also, the legs and the tail have been simplified and redefined. 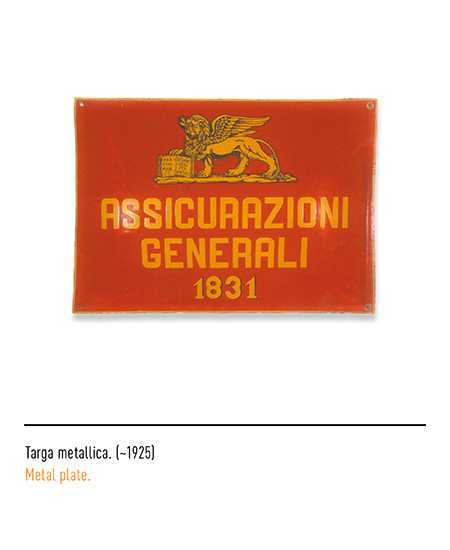 Giorgetto Giugiaro,Bruno Munari, MADE IN ITALIA, Inei, Bologna, 1988. 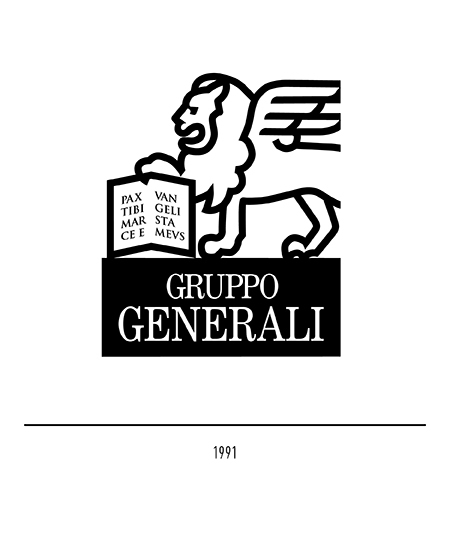 “Storia di un leone”, in IL BOLLETTINO rivista delle Assicurazioni Generali, n.3, luglio 1994. 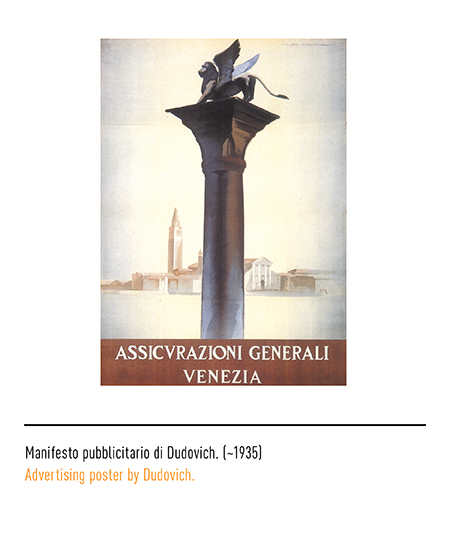 MARCELLO DUDOVICH OLTRE IL MANIFESTO, a cura di Roberto Curci, Edizioni Charta, Milano, 2002. 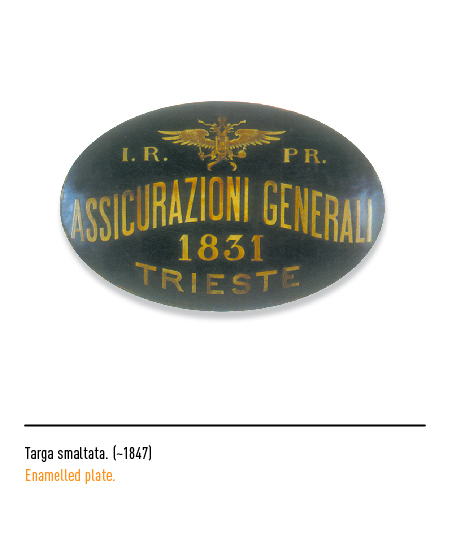 AAVV, GENERALI Tradizione d’immagine, Assicurazioni Generali, Trieste, 1993. 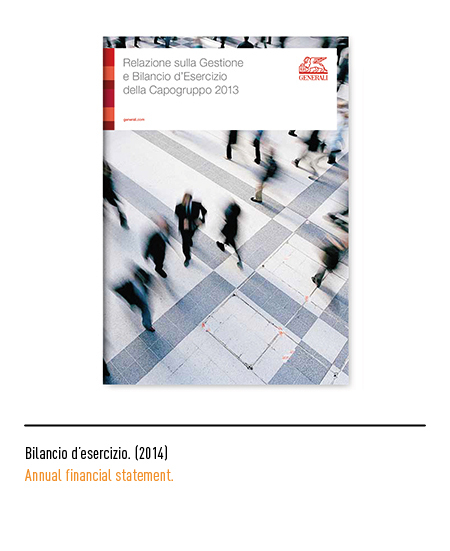 IL BOLLETTINO rivista delle Assicurazioni Generali, n.24/25, ottobre 2000. AAVV, PUBBLICITÀ & SUCCESSO, New International Media, Milano, 1986.